A traditional Thai sweet chilli paste made with quality ingredients such as fresh shallots and garlic, fried and blended with chillies and shrimps to produce a full flavoured aromatic ingredient that is perfect with vegetables, meat or seafood. Add to stir fries, marinades, dressings to create authentic Thai dishes. 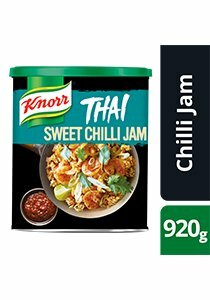 Weight - 920 g. Weight per serving/portion - 20 g.
Authentic Thai Recipe. Made with real spices. After opening store in a refrigerator for up to 5 days.